With anthology Workers' Tales, children's literature professor Michael Rosen curates fairy tales from the 19th and 20th centuries that resonate with workers' rights activists and their children today. 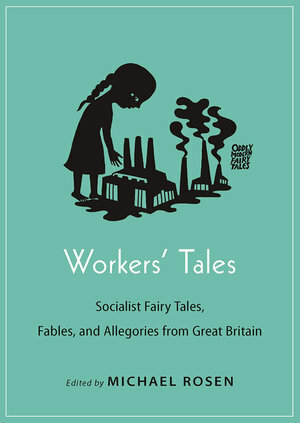 As I was reading "A Fairy Tale for Tired Socialists" and other stories from Michael Rosen's thought-provoking anthology Workers' Tales: Socialist Fairy Tales, Fables, and Allegories from Great Britain, I kept reminding myself to think about the fairy tales I read as a child. The mermaid in Hans Christian Andersen 1836 The Little Mermaid, doesn't marry her prince in the original story but instead is turned into a daughter of the air (essentially sea foam) in what can be viewed as a heavy-handed religious story. In the Brother's Grimm 19th-century German fairy tale, Snow White, a prince falls in love with a seemingly dead Snow White on display in a glass coffin. As I consider the context of the fairy tale genre (particularly the European fairy tale genre), the stories in Rosen's anthology make perfect sense (even when on the surface it might seem curious that a parent would read their child something with a title like "The Peasant and the Parasites. A Fable"). In most of these stories, the kings and princes (along with many religious figures and the occasional professional) are not the saviors. They are not the ones the princesses are trying to find and/or marry (nor do we see many princesses in these stories). Chance upward mobility for one character isn't a main theme. As 19th century poet, novelist, and activist William Morris said (and whom Rosen quotes in the introduction), "I do not want art for a few, any more than education for a few, or freedom for a few." These stories are about happily ever after for all (in one story this even includes the dog), and the villains are not witches or evil fairies but the upper classes, organized religion, and industrialization. Just as the fairy tales of the Brothers Grimm, Hans Christian Anderson, and Charles Perrault reflect the cultural concerns and fears of their times, so do the fairy tales in Workers' Tales represent some of the concerns and fears found in England in the late 19th and early 20th centuries. Take the aforementioned "The Peasants and the Parasites", written by R.B. Suthers in 1908. The brief story opens with an unnamed peasant working hard but doing okay. Then the King comes and tells the peasant "I come from the gods, and I have been sent to rule thy goings and comings, and to defend three from enemies… Thereafter the Peasant was the slave of the King, and did his bidding in all things." Shortly after the Priest and the Lawyer join the King, and the Peasant carries them all. When the Peasant is old and tired, the Doctor comes round and adds to the Peasant's burden. The story doesn't end happily. The MAN comes and begs the Peasant to stand up and cast off the parasites. The parasites argue and can't reach an agreement (even though what they are arguing over isn't that complicated). The story ends, "And the Peasant has not yet stood up, nor have the Parasites climbed down. But the Peasant is listening to the MAN with both ears." "A mermaid has not an immortal soul, nor can she obtain one unless she wins the love of a human being. On the power of another hangs her eternal destiny. But the daughters of the air, although they do not possess an immortal soul, can, by their good deeds, procure one for themselves. We fly to warm countries, and cool the sultry air that destroys mankind with the pestilence. We carry the perfume of the flowers to spread health and restoration. After we have striven for three hundred years to all the good in our power, we receive an immortal soul and take part in the happiness of mankind." Essentially the message is work hard, little mermaid (or little reader), and you too will eventually make it to heaven. Of course, most of the stories in this anthology aren't promising their characters (or their readers) heaven; instead, critiques of organized religion are common. "A Mystery", written by Caroline E. Derecourt Martyn in 1896, describes two characters looking "to be made one with the bond that cannot be broken." They begin their search for this bond in The Temple of Religion. When the Priest brings forth "an iron chain too heavy for them to bear" they flee "affrighted" only to find happier times in The Palace of Justice (which includes, among other things, the Hall of Pleasure and the House of Love). "That good old 'once upon a time' was the best time that ever was: for though the people sometimes met with dreadful adventures, such as falling into the clutches of giants or ogres or wild beasts, they were clean and honest adventures, and if the people got killed in them they died a clean and decent sort of death, and were not horribly and villainously and stretchingly killed by foul smoke and bad air, and all kinds of sly creeping diseases that wouldn't face them in fair fight, as is the case nowadays." Clearly, there's some humor and a range of moral messages, many of which are still applicable today. In Harford Willson's "The Scarlet Shoes, (The Story of a Serio-comic Walking Tour and its Tragic End)" one of the characters is accidentally killed simply because he dresses differently. The killer is his friend who remorsefully turns himself in and, in very modern fashion, is sentenced to ten years in prison. While there's little humor in this story, the moral of the message is, of course, still relevant. Perhaps it's no surprise then, that Workers' Tales is part of a series titled Oddly Modern Fairy Tales. According to series editor Jack Zipes, "Postmodern before their time, the tales in Oddly Modern Fairy Tales transformed the genre and still strike a chord." And many of the stories in this book will definitely still strike a chord. As with all anthologies, some selections will resonant more than others, and the book requires an understanding reader. With character names like Jack Clearhead, Labour, and Social-Ism, there's rarely anything subtle about the messages in these tales, but still, they are fascinating to read, both to see how they fit into the fairy tale genre and to see which messages still ring true today.